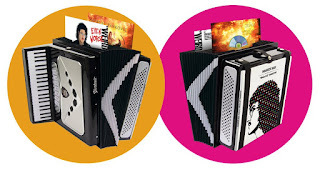 Legacy Recordings presents Squeeze Box: The Complete Works of "Weird Al" Yankovic, a career-spanning box set of all fourteen studio albums, remastered for CD and 150-gram vinyl. They're housed in an exact replica of the his signature accordion. It also includes a 15th bonus album, Medium Rarities, which features previously unreleased and non-album songs and a 100-page book. It will be released on November 24, 2017, but it should be pre-ordered now because only a limited number will be created after the pre-order ends. If you order via his PledgeMusic page you will also get an Access Pass to the private section of his site, which features exclusive videos of the creation of the box set and more. (All purchases are final.) Go here to see more and to purchase it.